The Tamron SP AF 17-50mm F2.8 XR Di ll LD Aspherical (IF) Pentax Fit lens is a lightweight, compact, fast standard zoom lens, designed exclusively for use with digital SLR cameras (APS-C Size). The wide-angle focal length of 17mm (equivalent to 26mm) obtains a wider angle of view than the standard zoom lens without any increase in size or weight. The fast f/2.8 aperture gives a natural out-of-focus effect which is great for portraits, whilst the minimum focusing distance of 27cm over the entire zoom range gives a maximum magnification ratio of 1:4.5 at 50mm. 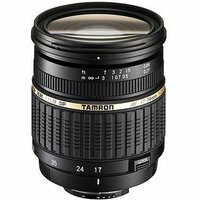 The Tamron 17-50mm f2.8 XR Di-II LD ASP IF lens optimises the overall distribution of optical power via the use of XR (Extra Refractive Index) glass. A Low Dispersion glass element is used to effectively compensate on-axis and lateral chromatic aberrations.